More than half population world over are overweight, so weight loss outlets are a thriving business these days. Every other person seems to be sweating it out at the gym with swanky equipment just to lose those pounds of fat accumulated all over the body. While losing weight is definitely rocket science for 90% of the overweight people, it is very easy to add on those pounds. All it would take would be a week with a sedentary lifestyle and munching on all those creamy and greasy yet real yummy junk food. But losing even an inch would take double or triple the time spent on increasing the waistline. To sum up losing weight, it’s not a jolly and fun filled picnic. • Even if there is a space constraint at your abode, you can use the exercise bike which is one of the most effective and best methods of losing weight. An exercise bike also does not occupy much space and can be placed in any corner of the house. • The exercise bike when used in the right manner can help you reduce fat in a spectacular manner. The best part about an exercise bike is that it helps you work out your full body. It would help tighten your abdomen and thigh region which are one of the most exposed areas prone to easy weight gain. 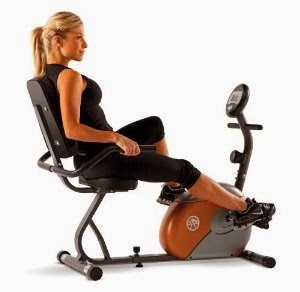 • For beginners to start off, you can use the exercise bike for about twenty minutes. This can slowly be raised up to thirty minutes a day. Using an exercise bike pumps up your heart rate and also helps you burn a minimum of 300 calories. This is quite a good number for a start. • In case you are looking to lose weight faster, you could use the interval method. This method includes an initial warm up session of about 3 minutes, followed by intervals of intense pedaling, alternated with periods of low speed. • For example you can gently pedal for 90 seconds on a low level of difficulty, then go as fast as you can for 30 seconds on an increase level of difficulty, then go slowly again for 90 seconds...for a total of 3-5 intervals. This method decreases the amount of time needed for the workout even further. • When you alternate the intense workout with intervals in between you burn a lot of belly fat. But be cautioned you cannot expect results over night as you definitely did not pile up those extra flab over night. • Over a period of time when the exercise bike is used regularly at home the results will definitely show up! You could make the workout interesting by listening to your favorite music or watching a good movie on TV. This way the workout at home would double up as your relaxation time. This was a guest article by Julie Roy, a freelance writer with a big passion for Health & Fitness.